Yesterday when I went to pick up Buddy from school, his teacher told me she saw me in the paper and that they talked about it during circle time. Later that night, he told me he was really happy to see me in the newspaper and to talk about it with all his friends. He had the cutest little proud smile on his face as he shyly told me all about how he saw my picture and didn’t know I was going to be in the paper and asked how I did that. The reaction from Baby Girl was the opposite. She picked up the paper in the car after we picked her up and finds the Island Life section and is just “reading” some story like she can understand everything, holding it up like a big, important adult. Mr. Pikko told her, “Did you see who’s on the front? ?” She just nonchalantly says, “Yeah. It’s mom.” My bentos don’t impress her and neither do my newspaper interviews! LOL! 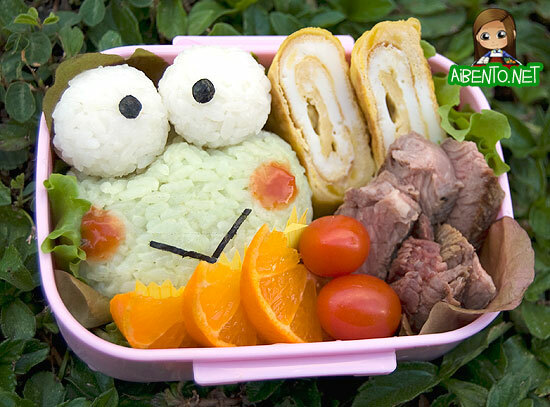 This bento was really rushed and Keroppi’s color didn’t come out so great. I used a whole packet of green deco furi and that’s as green as it got. It took me a while to get the size of his eyes right and his pupils had to be cut freehand from nori because every punch I tried wasn’t big enough. I probably should have just cut his mouth with scissors too, as it looks a little too thin. We had spaghetti for dinner last night, but since I wanted to make an onigiri, that didn’t mix too well so I used leftover steak from Sunday. I probably should have pan fried it to give it better color, but we were already running really late, so I had to just nuke it in the fridge, slice it, and throw it in. Here’s a closer look at Keroppi. I used ketchup to dot his cheeks because I didn’t have any ham to make pink cheeks. The box is lined with more lettuce from Mr. Pikko. I was really mad at how my tamagoyaki turned out, with the white stripes in the middle. I guess I’m just bad at beating eggs now, instead of cooking them. The outside of the roll looked perfect, forming a nice rounded rectangle shape without me needing to mold it at all. I’d added soy sauce to give it flavor and it also gave it a nice golden brown outside. For snacks I brought a cameo apple and light blueberry yogurt. It’s missing green, but without time I had to just make do with taking a photo outside on the grass. 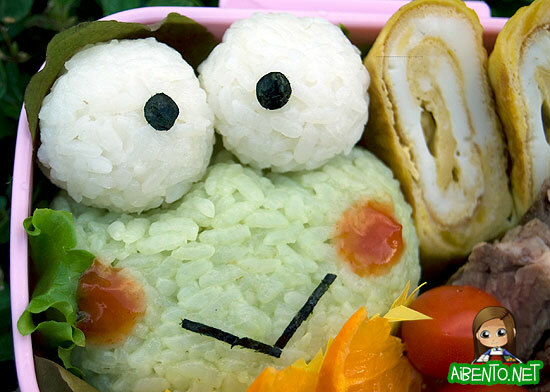 Keroppi has always been one of my favorite Sanrio characters, so it’ll be fun come lunchtime today.